Talgo: "The current UK political situation does not deter us." Doncaster station could be remodelled, in plans unveiled by the town council on July 10. Proposals involve moving the existing car park to the old Royal Mail Sorting Office site, allowing the area made redundant to be turned into a public space. Additionally, there will be a dedicated taxi rank, extra parking and better drop-off facilities. The council says the plans will ensure an easier flow of traffic around the station, as well as easier pedestrian access to the city centre. Plans also include better access for cyclists and secure cycle parking. Virgin Trains, which manages the station, plans to invest £500,000 on a contemporary glass canopy on the front of the station building. Residents, businesses and visitors are being asked for their views, with events being held across the town as this issue of RAIL went to press. The redevelopment is being carried out by VT and South Yorkshire Passenger Transport Executive (SYPTE). 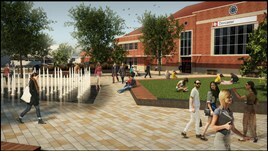 The council secured £7 million of Sheffield City Region funding to transport the forecourt in February. Our assistant editor, Richard joined RAIL in 2005 from local press, where he had been working since 2002. He covers all aspects of news for the magazine and website, specialising in operations and rolling stock. On a recent visit I found Doncaster to be a well-appointed and well laid-out station in good condition. It's one achilles heel was what would be an airy and spacious booking hall cluttered up with a huge brick-built lift shaft. Clearly these days a lift is a DDA requirement, but when it's time to replace this it needs to a made out of glass to reduce the visual impact. RAIL is Britain's market leading modern railway magazine. The nominations are in. Now we need YOU to vote for your favourite. @PhilBlades And the keeper’s handball, followed by his constant timewasting?